“The only constant is change.” My mother loves that phrase… or more likely, she hates it just as much as I do, but likes tossing it at me when I am complaining about something. I realize that change is inevitable. Nothing can stay the same forever, and I probably wouldn’t want it to anyway. It’s the letting go that I have the most trouble with. I’m a bit of a hoarder really. A hoarder of things and people and more than anything, possibilities. When we clean out the basement, my husband sees a broken lamp. I see a lamp with the potential to be something new. It just needs a little work… Maybe a new lamp shade (I saw a great idea on Pinterest). Sure, its brass, but I could spray paint it… maybe blue? I hoard potential… a dream or possibility that could come true… If I hold on long enough…. If I believe hard enough….. Worse than “stuff,” I hoard people…. holding onto friendships and family longer than I ever should. The lamp is easy, I fix it, or it remains broken forever…. people are harder…. sometimes, no matter how hard I work…. the relationship will always remain broken. The hard part is deciding whether I can live with the lopsided relationship… where I am always the one to call them…. the one to invite them to dinner… the one who drops everything and goes to their rescue… again. How many times should you ask yourself “why do I bother?” before you realize…. you shouldn’t. These food allergies are a toxic relationship…. literally. Recognising that is getting easier. Sure, that cupcake looks sweet…. and I can remember times when it was perfect… but now it makes my head hurt… my mind foggy and so tired… it gives me stomach-aches…. and now its time to let it go. Yes, I’m referring to a few certain relationships and situations specifically today… The allergy detox has just really brought it to the forefront of my mind…. there are a number of things that need to be let go right now. People, situations and food…. you only hurt me…. and I don’t want that anymore. The great thing about letting go? Now there is space for something new. Speaking of “new”… Since I started blogging about my allergies I met some great new blogger friends who share my allergy challenges. While I am sorry that they too have to struggle with food, I am so happy that they are sharing their discoveries with me. I’d been whining that I missed chocolate and Faking Picture Perfect (Love the name!) shared her Chocolate Cake recipe with me. My aunt’s birthday was yesterday and I figured that it was a perfect time to try out! My aunt and cousin are both vegetarians, so they’re getting a kick out of me turning practically vegan. FPP was going for dairy-free… I also wanted gluten-free, so I used King Arthur Flour Multipurpose Gluten Free Flour in place of regular flour. Next time I’d like to try to replace the eggs too. 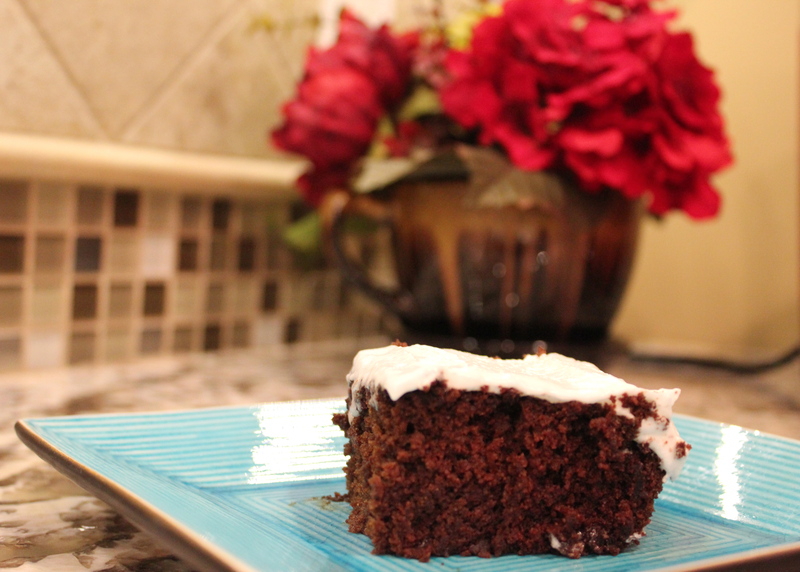 Hubby whipped up a batch of his mega-delicious-eat-it-straight-from-the-bowl icing and it was absolutely delish! Family loved it! Thank you Faking Picture Perfect! Preheat Oven to 350 degrees. Grease and flour 13×9 pan. Combine Coconut Milk, Vinegar, Water, Oil, Sugar, Eggs, Vanilla, Baking Soda and Salt. Using a large wire whisk, whisk until well combined. Add Flour and Cocoa Powder; whisk until smooth. Pour batter into pan. Bake for 35-40 minutes or until the center bounces back when lightly touched. DO NOT OVERCOOK!